Young people in Lesotho, as in many parts of the world, are facing challenges. High rates (35%) of unemployment, lack of access to quality education, gender inequality, and significant threats from the HIV/AIDS pandemic have left a generation of young people in Lesotho with limited opportunities. In order to improve conditions for young people in Lesotho, a ground-breaking partnership between the United Nations Volunteers (UNV) programme, United Nations Population Fund (UNFPA), German Federal Ministry for Economic Development and Cooperation (BMZ), Lesotho National Youth Council, Office of the Director of Youth at the Ministry of Youth, and youth-focused VIOs in Lesotho, builds the employment skills of young people, provides them with greater access to information on health and gender issues, and provides them with spaces to network and learn. In a unique innovation, this initiative is almost entirely volunteer-run. Both international and local volunteers are tasked with designing and implementing the project, thus ensuring that it is locally-relevant and responsive to local youth needs. It also helps harness the energy and enthusiasm that volunteers bring. Throughout 2016, the project established ten youth centres across Lesotho. The centres cater to youth from the local community, and ensure an even distribution of youth from urban and rural areas, from various educational backgrounds, and social backgrounds. Crucially, the youth who engage directly in the centres are then deployed in the wider community to support other young people – this ‘cascading effect’ ensures a wide reach into communities. Key activities included training for more than 400 community youth volunteers and youth leaders on community engagement, civic awareness, the Sustainable Development Goals, and comprehensive sexual health education (CSE). 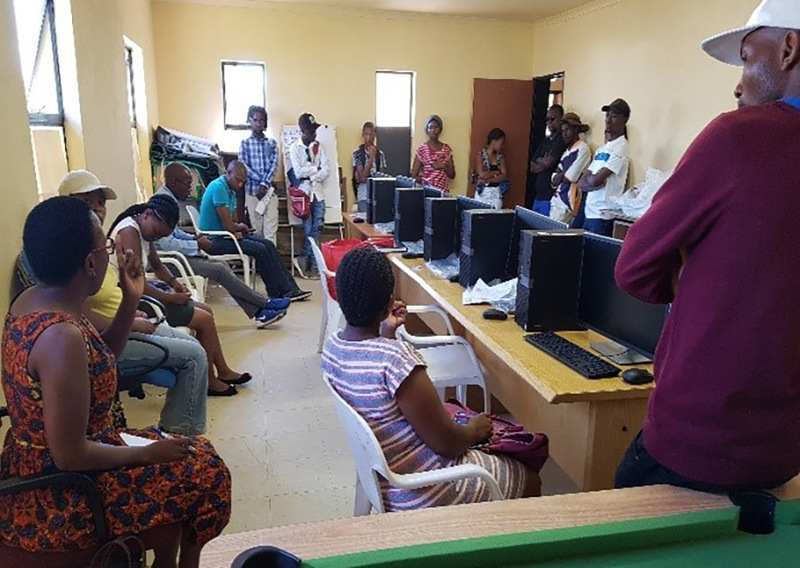 Through a workshop on social media and civic engagement, the project empowered 50 community youth leaders to establish their own social media platforms to engage other young people. The platform created by UN Volunteers here in Lesotho opened doors and massively facilitated the role of volunteers in the development of young people, especially adolescents. The project also helped strengthen Basotho youth organizations through the creation of a database of relevant organizations in the country aimed at improving coordination and networking. UNV also hosted a three-day retreat for 30 youth-led volunteer-involving organizations (VIOs), creating a coordination mechanism for VIOs, subsequently used to develop a country-wide talent acquisition platform and entrepreneurship support network. The strong collaboration of the government, youth organizations, and the youth community in general was critical to the success of this project, as it helped establish proper management mechanisms, systematic consultation with appropriate stakeholders, and collaborative solutions to challenges. For UNV, this highly successful project can be viewed as an easily replicable model for other countries seeking to build the skills and experience of their young people while harnessing their potential for national development.